A new speed record by the Sunswift Australian solar racing team for the fastest electric vehicle over a distance of 500 km has been officially recognized. Their vehicle eVe can achieve more than 100 km/h. The official mark of the new speed record is 106.966 km/h. The previous one of 73 km/h had stood for 26 years. The main advantage of eVe is that it is not only an electric car, but uses solar power too. 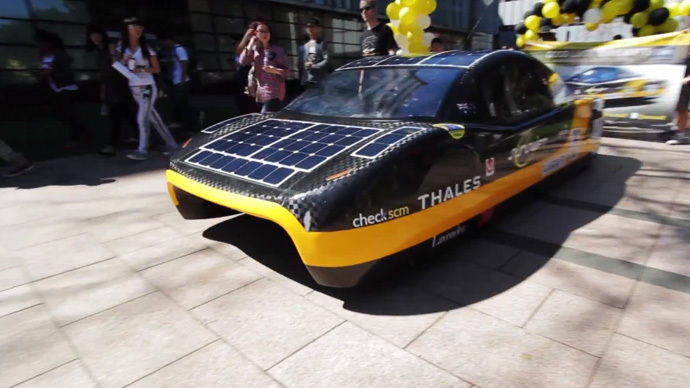 The car uses solar panels on the roof and also has a hood to charge a 60kg battery. However, the panels were switched off during the world-record attempt, leaving the car to run solely on the battery charge. According to the engineers, eVe can cover 800km from a single charge. The world record was unofficially broken on July 23 at a racetrack in Geelong, Victoria, Australia. However, the record in this field must be officially approved by the International Automobile Federation (FIA), which is the world motorsport's governing body. And, finally, in October the organization issued a new update of the records and approved the Sunswift team’s achievement. Sunswift was founded in 1996 and it’s Australia’s top solar car racing team. This record is not their first. They have already set a world record for the fastest solar powered road trip from Perth to Sydney, and a Guinness World Record for the fastest solar car. More than 100 students at the University of New South Wales (UNSW) have contributed to the record attempt over the past two years. “It's not often you can confidently say you made history before you even graduated,” Sunswift’s project director and undergraduate engineering student Hayden Smith said in a statement. With an official world record the team can now concentrate on a new challenge, which is to modify their car to meet road registration requirements. Smith said the car could be registered and appear on city streets within a year. The team is sure the car is ready for everyday use. UNSW officials also expressed their feeling concerning the record.